Saturday, July 15 saw 50 people Swim the Cam – 3.8km from Bryon’s Pool to Sheep’s GreePlaces. The event sold out within days of being advertised on social media. Find out more about the event from this article in Cambridge Independent. 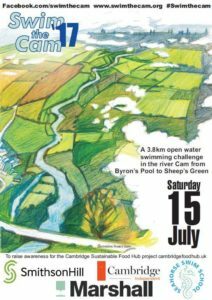 Funds raised from Swim the Cam go towards the crowdfunding initiative for the Cambridge Sustainable Food Hub. Swim the Cam ‘17 was sponsored by Marshall, SmithsonHill, Seahorse Swim School and supported by the Cambridge Independent.